What was he thinking? Normally he would have just sent someone like her away. If he allowed himself to rationalize his decision for giving her this job, he would have kicked her out of his club faster than normal. For reasons he cared not to delve into, he wanted this girl here and it had nothing to do with the fact that she would make a controllable employee. She had this charming innocence that surrounded her and it was compelling to a monster like him. She should have listened to her instincts. He read her mind, the demon in him roared in pleasure. She would be his! The scent of her blood combined with the awakening desire of an innocent, there was no way he could refuse the beast. Run little girl, the last remnants of his humanity wanted to scream. Forcing her out of his club that night had taken every ounce of restraint he had left. The way he had looked at her was almost primal. Her heart raced as she drove back to her small apartment. Longing filled her in a terrifying capacity, it was like nothing she'd known in her entire twenty-one years of life. Sleep didn't dim the need, instead he came to her in dreams showing her a passion that could only have been born from the demons of hell. New Orleans at night hides secrets down every alley. 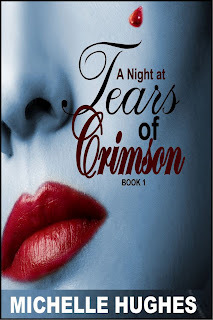 Welcome to Tears of Crimson, the New Orleans Vampire Bar. It's still hard to believe it's been four years since the original release of Tears of Crimson. The title has changed, the book has went through major updates, and still it resonates in my heart as my first love. Rafe will always be my first love, and Cara is more a part of me than anyone will probably ever know. Even several books later, the love story that is found within the pages still haunts me in dreams. Currently I'm considering having the books redone with a professional editor or possibly even doing a complete rewrite. There's still one book left to complete as well, so the possibilities are endless. I've put off ending this story that speak louder to my heart than any other for long enough. I loved the character of Cara. I really hope I get to visit New Orleans someday. Thank you so much Emma! We're heading back in August... I adore that place!